In this episode I share my thoughts on the benefits of cross stitch. Please keep in mind, I am not any sort of medical professional and if any of this advice goes against your own professional advice, please ignore it! So you have decided to start a new hobby; to find a creative outlet and take some time for yourself. But how do you choose a craft to learn? There are so many out there now and it’s so easy to find tutorials to learn them. I’ve dabbed my hands in a few crafts; knitting, crochet, hand embroidery and sewing. The only one that has ever stuck is cross stitch! Cross stitch has many, many benefits; some of which you may not expect (for example, helping you quit smoking). For me, the main benefit is that it’s just something for me. It brings out a passion in me and helps relax me at the end of the day. But enough about me, let’s see how it can help you. When you cross stitch you go into a kind of meditative state. The only things you are focused on are counting and stitching which is extremely soothing for the mind which reduces your stress levels but also keeps your brain active! However, I do not agree that it is the same as meditation like some people might say. Meditation is about being still and in the moment, and most importantly, letting your thoughts go before they can really come to life. I don’t know about you but this is the exact opposite of what happens to me when I cross stitch, but this is a benefit in itself. I revel in those thoughts that enter my head when I’m stitching. These thoughts usually turn into some of my best creative ideas because I’m letting my mind rest, but not closing it off completely. Kind of how people say they have the best ideas in the shower. Some think it is the water running over you, giving you some charged, mental energy. Others, the ones I agree with, will say it’s because you’re a little bored. Boredom has become such a negative thing; we feel like we always have to be doing something. I’m totally this way, constantly trying to multi-task or stack my tasks. While this can come in handy, it definitely stifles my creativity. Another time I have these ideas is when I’m a passenger in a car. Again, not very often but if we are doing a long journey my husband will drive. And I’ve mentioned on the podcast before that I get travel sick so I don’t usually do anything in the car. Sometimes I will cross stitch but that’s usually it. So I have a lot of time to day dream and I love it! I love getting lost in those thoughts and seeing what my mind creates. A little tip – have a notebook handy. If you are trying to diet or just cut out those late night snacks, settling down with your hoop can take your mind completely off food for a good few hours. Which is also helpful if you are trying to quit smoking as one customer, Leah, knows: “I started my pastel rainbow cross stitch kit and before I knew it 4 hours had passed and I hadn’t even thought about having a cigarette”. Stitching can also be a form of natural pain relief. One of the best reviews I have received is from Julie at Spotlesspinata Jewellery. Julie suffers with Ehlers Danlos Syndrome, POTS and Hashimotos Disease and she wrote “focusing on a project really helps me cope with my pain levels”. If you are suffering with any sort of pain, having your mind engrossed in cross stitch can help relieve it (as long as doing the stitches is safe to do so and won’t contribute to any further pain – as I said, this is not professional advice). Cross stitch is probably one of the easiest crafts to learn which means that you can have a creative outlet even if you’re not particulary “arty/crafty”. And let’s be honest, most of us don’t have to time or motivation to learn something that is complicated. I have instructions in every kit as well as online video instructions on this blog to make it even easier for you. If you can count to 10 and thread a needle, you can cross stitch. Another benefit is that every minute spent stitching is another minute away from the screen. In our world, it is very hard to step away from our phones, tablets and laptops but now that I stitch of an evening I spend significantly less time on my phone. Kids pick up on what we are doing so much. If we are on the phone a lot, they will want to be on the phone a lot. I learnt to cross stitch from my Nan (whose only screen time involved watching the soaps and 20 years later I am still also watching them) and my 3 (update: now 4, nearly 5!) year old is already learning how to do it. I love that this is something that I can teach and pass on to my kids and the fact it not screen or iPad based is even better. There is no better feeling than finishing a piece of hand made work and displaying it proudly, or giving it as a gift, no matter what it is. But I think that finishing a cross stitch project gives you even more satisfaction as you literally see every stitch forming the finished piece; like painting with a needle and thread. Once it is finished you get such a sense of pride and achievement knowing that you created something entirely by hand. And the best thing is that anyone can get this feeling because anyone can cross stitch. For a smaller, more personal community you can come and join my Facebook group! I am in there with lots of other like minded cross stitchers sharing our work. I also run regular discounts, giveaways and stitch alongs in the group. You can come and join us here. So, I feel like this is just the tip of the ice burg for the benefits of cross stitch and maybe only part 1. I’m sure there are many more and I would love to hear if you have found any of your own benefits of cross stitch that I could use to help write part 2! 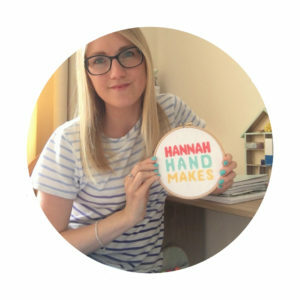 Just let know in the comments or email me hannahhandmakes@gmail.com – I love hearing from you! This month’s pattern of the month is from the shop Punochka on Etsy and is called In The Jungle and if full of leaves and a few florals. It uses 10 DMC colours and the designer stitched it on 14 count, black Aida and it fits perfectly in an 8 inch hoop for framing. *Affiliate link. I may earn a small commission if you click this link but I never recommend anything that I don’t use or read myself!